Standard connector clips are welded to the beam horizontal on the vertical contacts between the beam horizontal and the connector clips at the front and back of the beam horizontal. 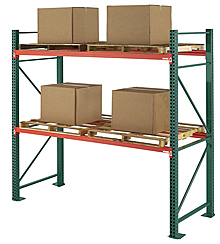 This is a more secure beam assembly than bolts or interconnect locking systems. 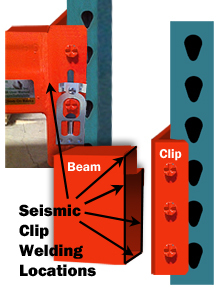 Seismic clips have additional welding on the top and bottom contact locations, making the beam even more structurally sound. This added welding resists lateral pressures from end impacts and seismic activity.